The Packing House, Little Trevean Farm in Rosudgeon, near Penzance sleeps 4 people. Little Trevean is a delightful small hamlet of three stone barns lovingly converted (refs 29436, 29437 and 29438). Adjacent to the owners’ home, they are set in a peaceful rural location overlooking gardens and fields to the sea beyond. The area is popular with walkers, as the barns are just a short walk from the South West Coastal Path leading to a number of picturesque small beaches and coves including Prussia Cove and Perranuthnoe. The properties are just a few minutes‘ drive to the historical town of Marazion, with tea rooms, art galleries, curiosity/craft shops and St Michaels Mount rising from the sea which can be reached at low tide on foot or high tide by small boat. The beautiful, long, white sandy beach of Mounts Bay is perfect for an afternoon stroll, sun bathing, swimming or kite surfing. It is just a 20-minute drive to the beach at Sennen, which is famous for its wild ocean and surfing. Visit the quaint fishing harbour of Newlyn and the picturesque village of Mousehole, legendary Lands End or the Minack open air theatre, cut in to the rock face with the ocean as backdrop. The busy town and harbour of Penzance with its long promenade and Lido is close by, or take a day trip to the beautiful Isles of Scilly by sea from Penzance or small aircraft from Lands End Airport. A 30-minute drive away is South Cornwall, with its tranquil sailing waters and the busy port of Falmouth, which is home to the National Maritime Museum and Pendennis Castle. Visit the stunning Helford River and creeks which are popular for sailing, fishing or simply relaxing. The area has an abundance of tropical gardens to visit, including Trebah, Durgan, close to the Helford River, and Trelissike, just outside Truro. 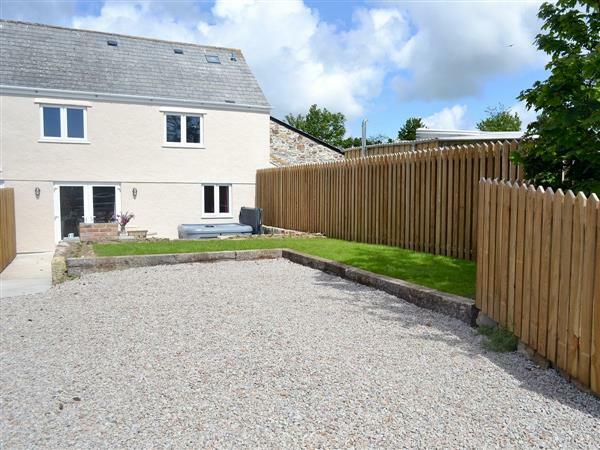 Within easy reach of the rugged North Coast, which is popular with surfers, with long beaches and sand dunes of Hayle and the pretty harbour and beaches of St Ives. Beach ¼ mile. Shop and pub ¼ mile, restaurant ½ mile. Refs refs 29436, 29437 and 29438 and 27491 [Bluebell Barn] (located ¼ mile up the lane) can be booked together to accommodate up to 14 guests. All on ground floor: Living room with French doors/dining room/kitchen. 2 bedrooms: 1 double, 1 twin. Shower room with toilet. Wheelchair access. Holidays run from Friday to Friday. For a better idea of where Little Trevean Farm - The Packing House is, you can see Little Trevean Farm - The Packing House on the map below. Little Trevean Farm - The Packing House is in Cornwall; should you be on the lookout for a special offer, you can find all the special offers in Cornwall. It's always worth checking to see what is on offer at the moment. Do you want to holiday near Little Trevean Farm - The Packing House (29436), you can see other cottages within 25 miles of Little Trevean Farm - The Packing House; have a look to find your perfect holiday location.